A New Map of the Northern States containing The Kingdoms of Sweden, Denmark and Norway, with The Western Parts of Russia, Livonia, Courland and Ca. 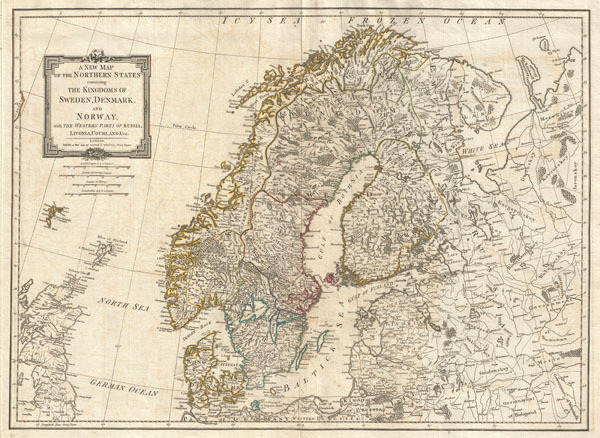 An extraordinary 1794 map of Scandinavia by Laurie and Whittle. Covers from the Faroe Islands east as far as Moscow, north as far as the Arctic, and south as far as Prussia. Includes the modern day nations of Norway, Sweden, Denmark, Finland, Latvia, Estonia, Lithuania, Germany, Poland and Russia. Renders the entire region in extraordinary detail offering both topographical and political information. Fjords, forested mountains and lakes are beautiful rendered in fine engraving. Color coded according to region. Identifies the legendary Maelstrom off the coast of Norway. A key and title cartouche appear in the upper left quadrant . Published by Laurie & Whittle for Kitchin's 1794 General Atlas. Very good condition. Light offsetting. Original centerfold. Rumsey 0411.025. OCLC 7160203. Phillips (Atlases), 4300, 6008. Bancroft Library G5200 1794.A5. Shirley, R., Maps in the atlases of the British Library, T.LAU-1c (1799 ed.). National Maritime Museum, 375 (3rd ed. 1801).